European cavalries of 18th and 19th century inspired the pomp and splendour of martial uniforms at Pankaj and Nidhi. Braids, cord-work, medals and badges were used as embellishments on hues such as blues, greens, earthy olives and ochres. Merino wool, heavy crepes and striped grosgrain fabric were used to stunning effect. A melange of the Memphis art movement and the milky way, Sanchita presented oversized, boxy and A-line shapes. Memphis inspired patchworks, embroidered bomber jackets, net tops, polka dot tights, sparkling sweatshirts, shirt dresses and faux fur skirts made a stunning appearance. Lace-up ankle boots, pointy sneakers and ballerinas punctuated the galactic line. 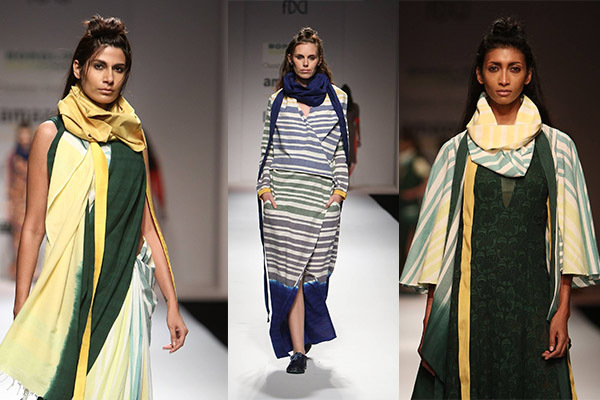 Anupama Dayal brings Nagaland’s tribal elements into her line of wrap dresses in striped prints, tunics with elephant prints and culottes in drum prints. Knee length dresses in khadi cotton, off shoulder tops and an array of kaftans with extravagant headgears brought the sartorial wonders of the north eastern state into the limelight. Click here to read about what inspired the collection. 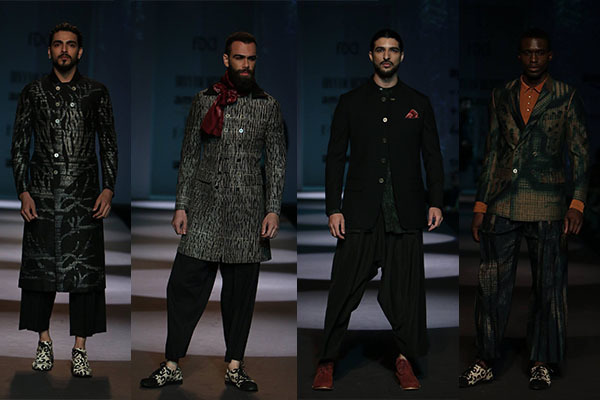 A regal affair at Rohit Kamra in an array of cutwork and gingham jackets with upturned collars, and sherwanis with pencil pants paired with monkstrap shoes and boots. An ode to the modern globetrotter, Divyam Mehta’s line included samurai trousers, gilets, trench bandhgalas, double breasted suits paired with desert boots and animal print sneakers. Jackets hand quilted with kantha embroidery in wood grain patterns had us swooning. Ujjwal Dubey does edgy, minimalistic fashion with slouchy, pleated and dhoti-style pants along with asymmetrical kurtas, jackets, longline and waist coats for men and women. Less is more at Antar – Agni. 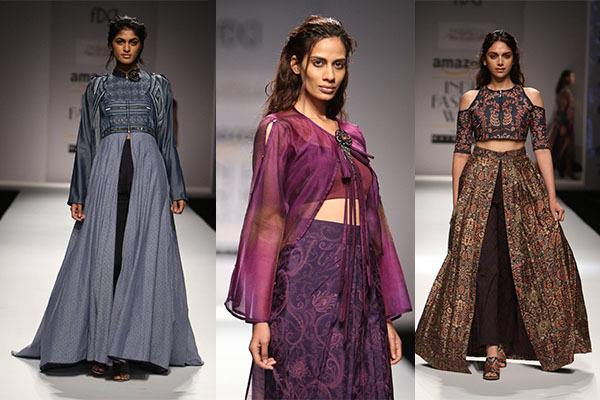 Shruti Sancheti draws inspiration from Constantinople and creates long pleated skirts, midis, capes, peplum shirts, wide-legged trousers in asymmetrical hemlines and surface ornamentation all evoking a boho-vibe. Chandrani Siingh Fllora pays tribute to Lord Shiva with Indo-Western silhouettes in snow white, corroded rust, midnight blue, ash grey and indigo hues. Trishul, conch shell and cannabis leaves appear throughout. The accessory show saw some lust-worthy baubles in silver and gold at Mine of Design by Sahai Ambar Pariddi, Valliyan by Nitya and Vasundhara, leaving us spoilt for choice.